Which major leaguer do parents want their little leaguers to imitate? Who was shot in the leg by Mark Wahlberg’s character in the movie The Other Guys? Who, at times, is the most overrated player in baseball? The reason Jeter is the answer to the final question is largely because he is the most scrutinized player in baseball—possibly in the history of the game. Nobody gets riled up if Adam Jones wins a Gold Glove he didn’t deserve or if Shane Victorino receives some extra praise from announcers. Not so with Jeter. He has played shortstop and batted at the top of the lineup for the most popular (and most hated) baseball franchise of all time. Over-analysis comes with the territory. Yet Jeter never flinches. The Captain always says and does the right thing on and off the field, which is a minor miracle given the city and media market in which he plays. That is why it was surprising when Jeter’s contract dispute went public this past offseason. While a blind resume would not have netted Jeter the three-year, $51-million contract (with a complex fourth year option) he ultimately received, Jeter has always been about more than the raw numbers. Considering the money the Yankees throw around, they could afford a little “waste” to retain a franchise icon. When the Subway Series was in its infancy, I remember my friend’s dad, a Met fan, reminding us he hated the Yankees but saying he’d love to have Jeter on his team. (I begged to differ: Who needed Jeter when we had Rey Ordonez?) That is a constant throughout Jeter’s career: respect. From opposing fans and opposing players. His most controversial on-field moment came in the The Jeffrey Maier Game, something Jeter had no control over. After all, how could a fan watch Jeter and not want to help him out should the opportunity present itself? My estimate is Jeter would still be around 2,500 hits if it weren’t for his annual battles with the Mets, though the official statistics tell me he’d have only 122 fewer hits. With 326 total hits in interleague play, Jeter is the all-time leader in that category. In other words, no matter who you root for, Jeter has likely done well against your favorite team. It was during last year’s Subway Series that I started to notice Jeter’s decline, in particular the frequency he was swinging at—and missing—the first pitch. My theory was that he no longer trusted himself to hit from behind in the count. The numbers prove he wasn’t swinging at the first pitch any more often last year than at other points of his career, but that’s sort of the point: Even those who only watch Jeter for a handful of games each year have an opinion of him. In discussing Jeter with my friends the other day, I noted that Jeter and Ken Griffey, Jr. were the only two positions players that, if it was revealed they took steroids, would surprise me. Even as Jeter’s skills fade, he remains a class act, a role model for young players. That being said, I won’t be celebrating Jeter’s 3,000th hit. Why should I? He’s an overrated bum. Two years ago, the first article I published on this blog dealt with interleague play and how I thought it had lost its luster. I still feel that way and last night’s crowd at Yankee Stadium supports my theory. I was one of the announced 47,874 fans in attendance, meaning the first Subway Series game of 2011 was not a sellout. I realize the weather forecast was not great and the pitching matchup—Freddy Garcia vs. R.A. Dickey—didn’t excite the average fan. But it’s still Yankees-Mets on a Friday night. The crowd was late to arrive and didn’t make much noise once they got there. Yankees manager Joe Girardi, who played in the first Subway Series in 1997, called the atmosphere “subdued,” though he admitted that may have been party due to the lack of offense (the Mets won 2-1; the Yanks had four hits). As I noted in my previous interleague play article, the Subway Series has been just another set of games for the past few years. That first Yanks-Mets matchup (which I also attended) had a playoff feel to it. The thing is, three years into interleague play, in 2000, the New York teams did meet in the real playoffs—the World Series—and all games since have seemed less meaningful because of it. Yankees outfielder Curtis Granderson suggested to reporters after last night’s game that the Subway Series be limited to one three-game set per season, alternating every year between Citi Field and Yankee Stadium, and I hope MLB listens. 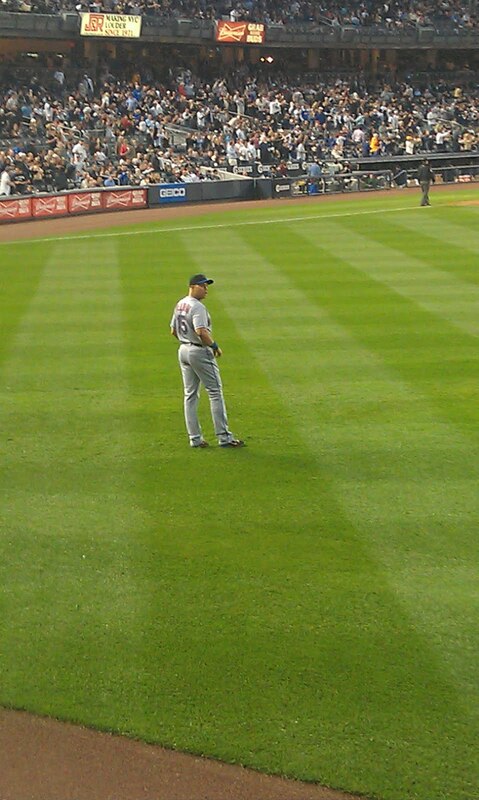 My Yankee fan friend who invited me wouldn’t let me wear Mets gear, but he couldn’t stop me from taking a photo of Carlos Beltran. On top of the lack of interest (which ticket sales confirm), interleague play is also not fair from a competitive standpoint. The Yankees have been extremely good since the start of interleague play and, given their payroll, stand to be good for the foreseeable future. Yet the Mets have to play them six times a season. The Subway Series and interleague play as a whole have shown there is such a thing as too much of a good thing, so for the second time in three years I’m making my case for a reduction, alteration, or outright elimination of interleague play. I was at the first Mets-Yankees game back in 1997 at Yankee Stadium. There was excitement in the week leading up to the games as sports talk radio, local television, and newspapers hyped the match-up, dubbing it the “Subway Series.” That anticipation led to a louder-than-usual crowd at the Stadium, as over 56,000 witnessed Dave Mlicki pitch a shutout and lead the Mets to a 6-0 victory. Flash forward to 2009 and nobody cares anymore. Sorry if that’s as startling as a Gary Sheffield foul ball into the third base seats, but it’s true. Simply put, the Subway Series, and interleague play in general, has run its course. It’s time to get back to a more traditional schedule, or at least reduce the frequency of tired “rivalry” series’. …and shorten the season. The baseball season is too long. This year, the regular season goes all the way until October 4th. Game One of the World Series is scheduled for October 28th. A potential Game Seven would be November 5th. You thought last year’s Fall Classic was cold and wet? Imagine if the Twins reach the World Series once their new outdoor stadium is completed next season. There’s nothing like Minneapolis in November! They have a humidor for the baseballs in Colorado; they’d need a de-icer for Minnesota. By cutting the season to somewhere between 147-154 games, the playoffs won’t go into late October and each regular season game will become just a little bit more meaningful. Of course, a shorter season means fewer tickets to sell, and owners won’t go for making less money. …but replace them with intra-league match-ups, preferably divisional games. So instead of Cubs-Royals, you get an extra Cubs-Cardinals series. Instead of Phillies-Blue Jays, you get Phils-Mets. This doesn’t shorten the season but at least interleague play disappears. Attendance would presumably rise as fans care more about intra-divisional rivalries than seeing a mediocre team from the other league. It would also make the schedule a lot fairer within the divisions. Look at the Mets: Is it fair that they have to not only play the Yankees every year, but they have to play them SIX times? This year, the East divisions were matched up against each other, so it was only three extra games. But in other years, it means the Mets have to play a franchise which, since interleague play began, has always fielded a very strong team. Instead of a series apiece against say, the Royals and Indians, the Mets get two against the Yanks. No big deal over the course of such a long season though, right? Tell that to Mets fans, who’ve watched their team miss out on the playoffs by one game each of the last two seasons. Not ideal, but owners would be more likely to compromise and go along with this. There is a general assumption amongst MLB fans that interleague play is extremely popular, but attendance at these games is skewed. Eric Rosen of Beyond the Box Score did some analysis that shows interleague play draws only about a .4% increase in attendance, or roughly 100 tickets per game. His research factored in that interleague games were often played on weekends and during prime baseball months (June and July). This is how interleague play gets its attendance advantage; not through legitimate fan interest. Perhaps owners will soon realize that fans are no longer captivated by the 12-year-old gimmick and eliminate, or at least reduce, the number of interleague games. Maybe the true rivalry series’ could be reduced to one series per year. I don’t know when some form of these changes will take place, but I’d be shocked if interleague play looks the same in five years as it does now.